This 2-part webinar will include a thorough discussion of the changes that make OASIS D. Changes include items removed, items changed, and new items. The expansion of the one clinician rule will be discussed with options explored. Your questions regarding new pressure ulcer/injury items and guidance will be answered. A comparison of the M1800 ADL/IADL items and the new GG items is essential to achieve accuracy for future outcomes and payment. 1. 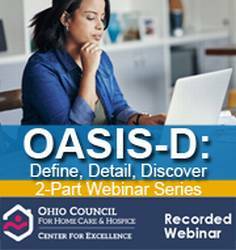 Identify M items removed from OASIS D.
2. Explain the expansion of the one clinician rule and how it may impact current practice. 3. Explain new guidance on completing pressure ulcer/injury items. 4. Compare and contrast ADL/IADL items with new GG items.